HIGH POINT, N.C. — You can’t help but sit up and take notice of today’s boldly upholstered chairs. A chair is just a place to plop until it’s dressed in the new, brighter solid and patterned fabrics that are lifting the profile of upholstery. “Color is powerful!” insisted Holly Blalock of CR Laine at the Spring High Point Market. “There is no doubt that it’s the color and artwork of the textiles on upholstery that creates the emotion behind our brand,” she said. CR Laine is known for its fabric choices, some exclusive to the company, but it is how they are applied that makes the difference. The company offers more than 800 fabrics and leathers, giving customers a real choice in how their upholstered pieces will look. “The Grace swivel chair from our Tobi Fairley for CR Laine collection is upholstered in our Garden Party Indigo, a vintage-style print that’s been given a happy and chic update by using only varying shades of blue,” Ms. Blalock said. Blue has been popular for several markets now, but other colors are demanding attention as well. John Robshaw’s Rafi daybed for Duralee, a textile company, uses both form and fabric to transport a space from pleasant to exotic. Mr. Robshaw debuted his Duralee collection during the Spring Market. 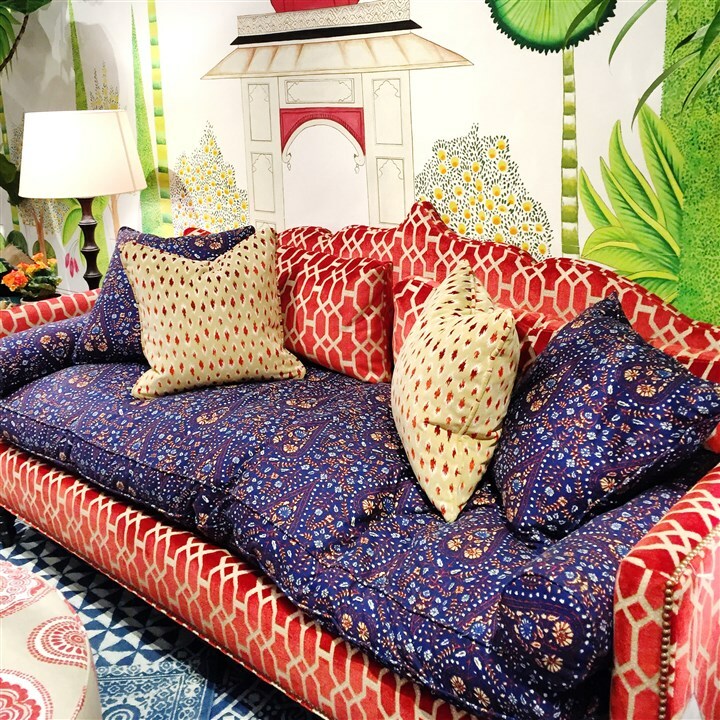 “His inspiration came from Morocco and India, especially for the Rafi day bed,” said merchandising representative Victoria Madonna. This unique piece, with a down and feather cushion making for a soft landing, will add a pulse to a stark contemporary space, or spice up a classic setting. . Going painterly with an exclusive printed velvet from Italy is Highland House. Its Morehead parson-style chair is covered in colors that could have been scraped from Monet’s palette. “Fabric choices are instrumental in setting the tone of a room,” noted artist and designer Dana Gibson. For her eponymous collection for the MT Company, she used a beefy buffalo check called Bon Air in raspberry to upholster its Parthie chairs. “It suggests a casual weekend vibe,” she said. Another casual look came from Design Legacy’s new Melton chair, tightly upholstered in Green Guinea fabric. Also playing with pattern and color was the Jackson chair by Taylor Burke Home. It was covered in a bright Beach Towel Bombay from the Blush label family of fabrics. North Carolina-based Lee Industries is an award-winning upholstered furniture maker known for being eco-friendly. Whether offering a bold stripe, bright solid or classic pattern with a twist, its collections are a staple for many retailers and designers. Its designers dressed a traditional English armchair in a cabana blue-and-white striped fabric called Hammock Marine. “We have updated this classic to fit into any modern lifestyle,” said Lee marketing director Bondi Coley. Also using a simple contrast to make a statement was the chaise by Mary McDonald for Chaddock. Its black velvet body is set off by a bright white wood frame. Although it has a certain time-worn elegance, you won’t find Wesley Hall’s nail-head-trimmed Heathcliff wing chair covered in Bonsai Indigo/Westbury Night fabric in your grandmother’s house. “Color and pattern are what makes a room go from ordinary to memorable, and there is no easier way to add this detail than in a lively textile or fabric,” said Ms. Gibson, the designer. Patricia Sheridan: psheridan@post-gazette.com, 412-263-2613, Twitter: @pasheridan.